Recently Google has been recommending that its users connect all their product accounts (Gmail, YouTube, Blogger, for example) and use a global login for all. In many respects, this is a great idea. You log in to one website and you are automatically signed in to use all Google facilities so you can switch from one to another with ease. However, Blogger users are finding that once their Blogger profile is connected with their Google account their posts, comments and About section will revert to their real name (or the name they have registered on their Google account). For many people this isn't a problem and helps enormously with Google Authorship but it has been pointed out that any comments left on other Blogger blogs, the "link" connects your Google account and not your own blog. Secondly, many bloggers choose to have a pen name or remain anonymous for a variety of reasons. It is very easy to unlink your Blogger account from your Google account. In your Blogger dashboard, hit the cog/gear in the top right hand corner and select the "Revert to Blogger profile" option. On the next page you will be reminded that this will disconnect your Google+ account and you will switch to a limited Blogger account. You will be asked to confirm your settings and you can choose a display name. 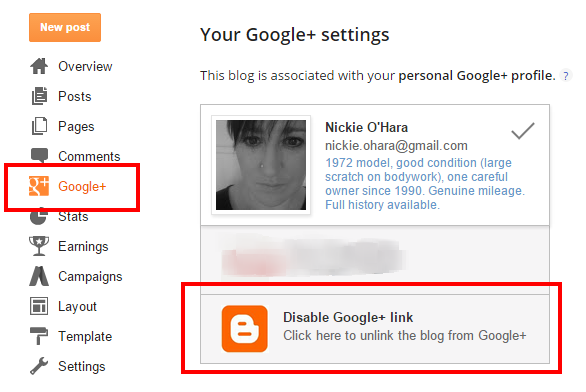 It is worth noting that once you have completed this step your blog is disconnected from your Google+ account and your posts will not be published automatically to your G+ account (if you had selected this setting). Let me know if you have unlinked your Blogger account from your Google Plus account. As an aside, I find that the apostrophe in my surname becomes distorted (reverts to code) in Google comments which looks untidy and it is something that I wish Google would recognise, then fix. This link has appeared on the Blogger dashboard which is more obvious.